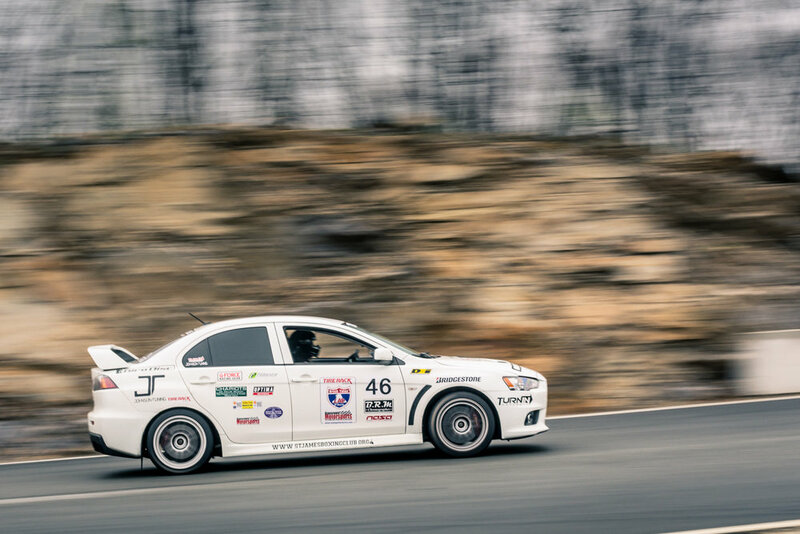 Summit Point was the first day that James took to the track. 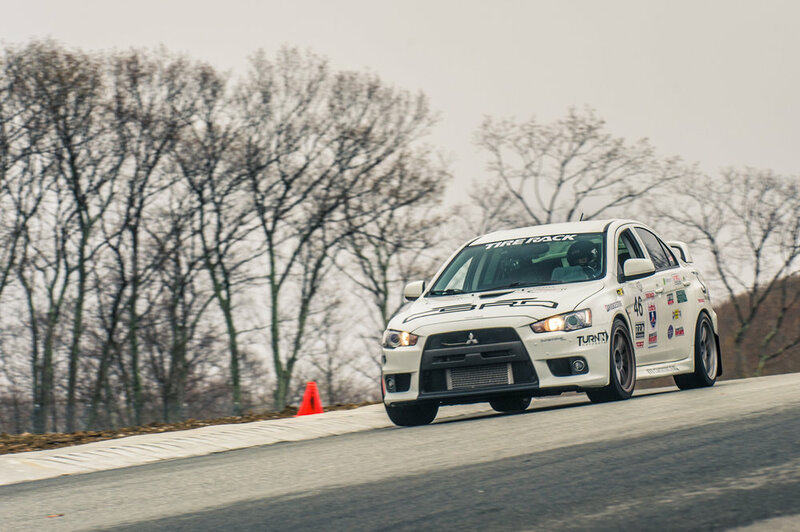 Despite having countless hours in his own Evo, this was really the first track day that he had in my car. Our buddy Jesus, was local to the track and was there for the day to hang with us. Throughout the day, he was able to give us some notes on how to pick up the pace at this track. We checked the tires, and did a rotation early to help save them. We had no idea how long they were expected to last on the road, so we wanted to be sure that we had enough tread to get back to South Bend. With that taken care of, we put the car back down on the ground and got into grid. 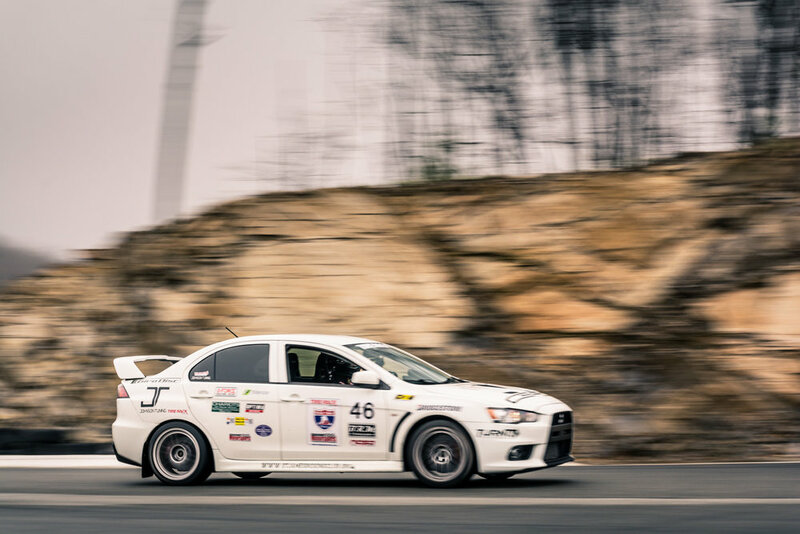 It was the first day that the weather wasn't terrible, and Ashely ventured around the paddock to get some pictures of cars making their way around the track. Brandon put down a stellar time of 4:11 in the One Lap RS for RS Motors which was good for 2nd place in the session. These guys continued to outperform, and were a testament to what a well setup car could do in the hands of three phenomenal drivers. Student and teacher in this shot. We'd been learning by example watching the RS Motors crew for more than a year. They are all a bunch of rad dudes. When it was James' turn to hit the track, he went out and put down his laps. In the video, you can definitely tell that he's still getting comfortable. He was off the pace, with a total time of 4:40.610 and finished in 31st for the session. When he got back to the paddock, Jesus and I really let him have it. Both of us knew he was faster than this, and something was holding him back. Only some of it was driver comfort in the seat. I could tell that he was still uncomfortable of racing someone else's car in a time attack. I literally had to sit him down and yell at him for being too cautious with the car. A big part of success at OLOA is trust between drivers. The car was paid off, and I knew nothing was going to happen, even if he did push the pace. We just had to convince him of it too. After suiting him up again, James went out with some new confidence. In the morning session, he came through turn 10 tentative, modulating the throttle until after the apex. In the second session, he went for broke. Much faster everywhere, he shaved 19 seconds from his combined 3 laps. The finish was good for 14th overall and was the highest finish we had up to that point. An incredible improvement, this was when he and I really started to find our groove in the car, and on the track. With the day's racing out of the way, we set out on the longest travel leg of the trip, toward Bowling Green Kentucky. As we were lucky to finish up early at summit point, we stopped at a Uhaul to downsize our trailer. All told, it took us an extra hour or so, but at least we had less cargo weight to deal with. With a travel distance of nearly 650 miles, it was a late night before we were able to get into the hotel. Because I had driven NCM in the past, I was going to take the driver's seat for the next day. That meant some extra time in the back seat catching some Z's during the travel leg, to try to be ready for the next morning. We got up after a short sleep, and headed to the track. We weren't there very long before this monstrosity showed up. Indeed, U-Haul was kind enough to admit that there was a problem with our trailer. Most likely, it was a problem with a wheel bearing causing the tire to not be tracking behind the car properly. In any case, what showed up on a flatbed was a 5' x 8' U-Haul cargo trailer. I had no idea if the car was going to be capable of pulling it through the mountains, or if the hitch that we had fabricated was going to be up to the task. It's not like we had anticipated that we'd need something robust enough to tow one of these. This thing was huge, and it we were definitely not going to forget that it was behind us once we got back on the road. Find us at 18:00 in, where Solomon talks about the OneLapGSR and our trailer troubles. The track was wet, and it was definitely highest risk track that I had been on up to that point. It was raining like hell. There wasn't run-off anywhere on track to compensate for driver error, and the main straight was a giant bend with standing water on it. I'd be lying if I told anyone that I wasn't scared out of my mind. My only goal for the first session was to not crash. Something that ran through my mind for the entire week was that you cant do well at OLOA, if you don't finish. The last thing that I wanted to do was to stuff it into the wall on a wet track that I'd never driven, and ruin the rest of the trip. I managed to finish the session safely, in 18th spot with a total time of 6:16.721. Certainly not setting the world on fire, but I'd take it. At least I didn't crash. It was here, that I really begin to understand how outclassed I was compared to the driver that had years more experience. 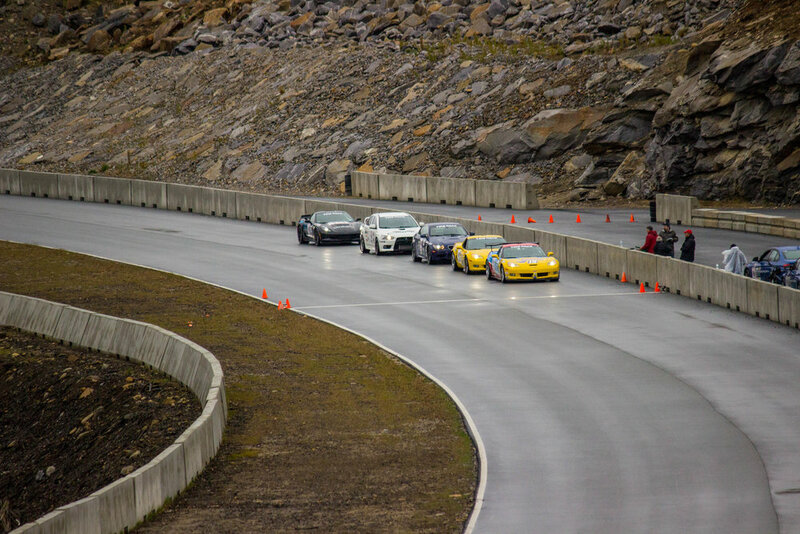 A few cars in particular went out in the rain, and attacked a course that absolutely terrified me. The elevation on this track is absolutely bonkers. Track videos do not do it justice. Betweens sessions, I tried to calm down and get ready for the next session. We ended up walking around the paddock and getting to know some of the other drivers in the field. For some reason, Rutledge Wood came over and started talking to me of all people. 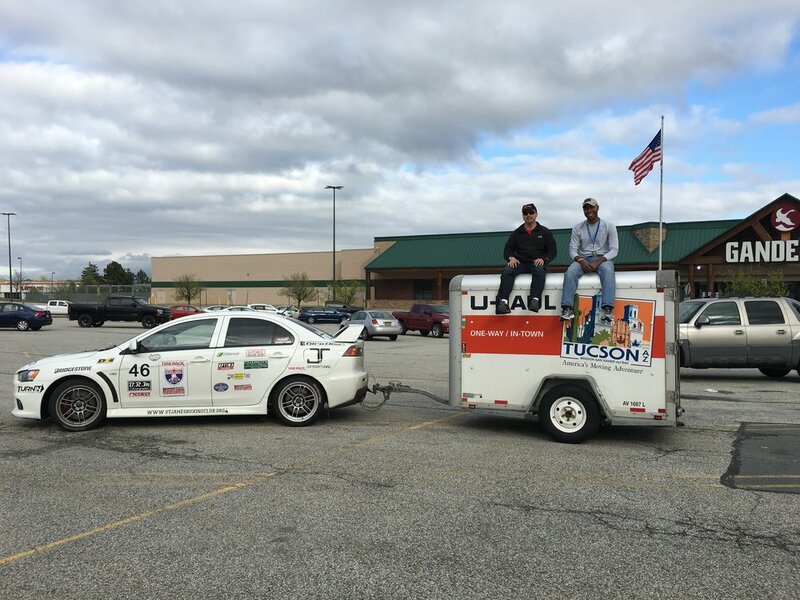 Interested in the car, we talked a little bit about the setup, trailer trouble, and what got us to this point. Feeling a little more relaxed and prepped for the next session, it started to rain again. Session 2 was even more wet than the first, and coming through the main straight was absolutely rad. Slower than before at 6:29.490, but we still managed to hang on to 18th spot for the session. We packed all our stuff in the giant trailer, and got on the road. We needed to get to Summit Point for the next day's racing. We spent the entire afternoon lugging around, trying to make it up through the mountains towing a house behind us. Around Middletown New York, we gave up and decided that this wasn't going to work. We pulled into the parking lot of a Gander Mountain, and tried to figure out what we were going to do. We went looking for the mythical cargo basket, and spent some time thinking about what we could stand to get rid of. We had a lot of stuff, and we needed to lighten the load. Ultimately, we wasted a couple of hours and changed nothing. We had too much stuff, and the votes were mixed. Once we reached a consensus and decided to press on regardless, we got back on the road and make our way to Summit Point, albeit at a much slower pace than in days prior. I can't even tell you what time we got to the hotel. I have no idea.